[Originally posted Feb. 17, 2011] As a die-hard Office fan, I am totally against the show continuing after the departure of its star Steve Carell. Sure Happy Days lasted four more seasons without Ron Howard and The Facts of Life went on without Mrs. Garrett, but these shows all suffered and it hurts me to think of this happening to The Office. Seven seasons is a very respectable run for a sitcom, especially one that has (mostly) kept the quality high and the laughs coming. And, sure, it boasts one of the greatest supporting casts in the history of TV, but I really feel the show is losing its anchor. This is what I’m proposing: a spin off. No, not a continuation of the series, but a whole new ballgame featuring the characters we’ve all grown to love. Sadly Troy McClure couldn’t make it to host, but let’s begin The Office Spin Off Showcase. In this hour-long dramedy, former accountant Oscar Martinez now makes a living as a Private Investigator. Although he has no previous experience, he has a secret ace in the hole: the twisted mind of Creed Bratton. Somehow Creed is able to solve even the most complicated mystery by using his street smarts and years of experience as a homeless petty thief. Together with secretary Erin Hannon they cash in while battling love and life along the way. After a tragic car accident caused by drinking under the influence, Meredith Palmer has an epiphany. Now having a son who is paralyzed, she must focus her life on his well being and future. She has cleaned up her act, so it seems, and is now a pillar of the Scranton community and head of her son’s school’s PTA. Fellow PTA members and couple Jan Levinson and Toby Flenderson know Meredith too well to trust her and watch her like a hawk. This dark comedy follows Meredith’s struggle as she deals with the watchful eyes of the community as well a life with a crippled son. Will she return to the bottle? Sleep with whomever to get ahead? Only time will tell if Meredith Palmer is a new woman. Todd Packer is one of a kind. He’s rude, crude and a womanizing fool – all things that shouldn’t make him a top salesman, yet it does. 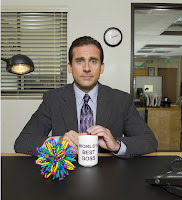 He’s Dunder Mifflin Sabre’s top guy and this reality show style sitcom shows us how he does it and avoids “the man”, or “the boy” as he likes to call Gabe Lewis. Along with his team of two sales rookies, Ryan Howard and Kelly Kapoor, and the insufferabley horrible salesman Andy Bernard, Packer gets himself into trouble in every city he visits. This traditional three-camera comedy series chronicles the lives of the Hudson family, led by none other than retired salesman Stanley Hudson. Having his daughter (Tia Mowry) move home after college really takes its toll on Stanley and new wife Cynthia (Telma Hopkins) and watch them as they deal with laughter and love in the tradition of The Cosby Show. Just don’t bother Stanley as he does his crossword; Cliff Huxtable he is not and he is not afraid to say it, especially to his live-in mother in law (Marla Gibbs) and bachelor neighbour Darryl Philbin. It’s Modern Family meets Melrose Place as three of everyone’s favourite Office couples move into the same new state-of-the-art town house complex that is built across the street from the home of Jim and Pam Halpert. Owned and maintained by Dwight K. Schrute and his now live-in girlfriend Angela Martin, watch as they continue to meddle in the lives of tenants Bob and Phyllis Vance and Kevin Malone and fiancé Lynn. As always, Dwight has a hidden agenda and it’s to ruin the lives of his now across the street neighbours as payback for the ridicule he has been subject to for years, not to mention the sudden bankruptcy of Schrute Farms that led to the disappearance of his beloved cousin Mose.